The excitement for innovation and entrepreneurship in the real estate industry, has increased at breakneck speed since 2013. Innovation and entrepreneurship is considered to be the backbone for economic development in many industries, including real estate. Despite record highs in global VC investments, the speed at which new real estate technology companies are forming are at record lows. 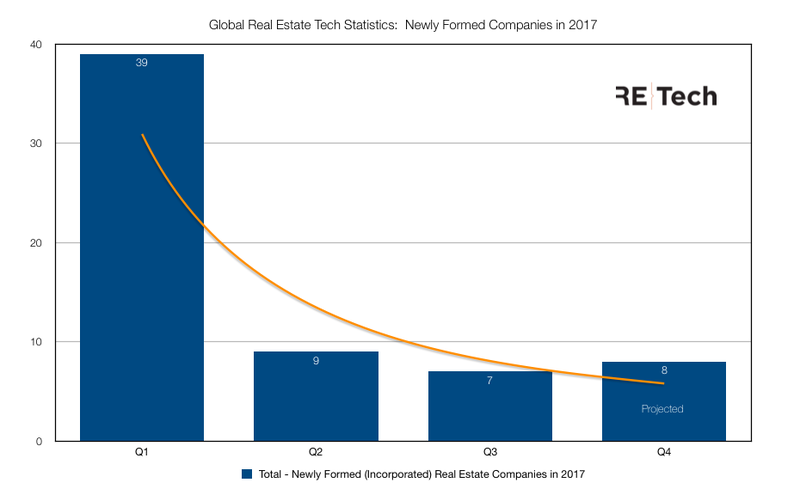 The total number of newly formed real estate tech companies decreased by 78 percent since the start of 2017. Much of the downward trend has been due to the continued decline of “sustainable” entrepreneurship coupled with a continued decrease in angel/seed financing. Year to date (Q1-Q3 2017), 55 companies formed with an estimated 8 more to launch in Q4 2017. By year-end 2017, newly formed companies in real estate will have decreased by an average of 35 percent. It’s important to note that although the volume of financing and newly formed companies has declined for some time now, the current level is not cause for panic. Moreover, vertical startups, like real estate tech, present a dynamic paradigm for the industry and investors alike.